, which we've now rolled out to all English-language users. 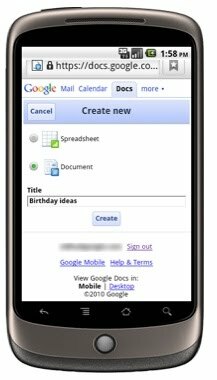 One of the new features that launched is creating new documents and spreadsheets on your phone. This is particularly useful to jot down quick notes on the run, whether it’s capturing that game-changing idea for your company while at the gym, or typing out your grocery list on the train ride home. For now, we support certain mobile devices, though we're working hard to accommodate other platforms as well. Creating a new doc is just one of several new features available on your mobile device, and we'd love to know how you're using your Docs on the go -- be sure to let us know in the comments. Yesterday, we announced mobile editing on Google Docs, which we've now rolled out to all English-language users.